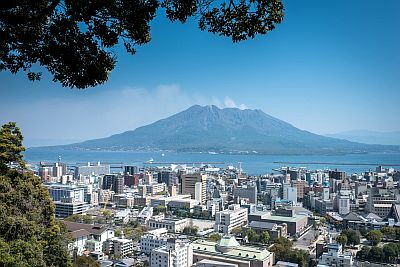 The climate of Kagoshima, a Japanese city located on the south coast of Kyushu, the southernmost of the major Japanese islands, is temperate humid, with quite mild winters, and hot, moist, and rainy summers. Like the rest of Japan, the city is affected by the monsoon circulation: in winter the northwest cold currents prevail, while in summer they are replaced by hot and humid currents of tropical origin. The city is located at a low latitude (at the 31rd parallel), in an area where cold air masses coming from the Asian continent, though still possible, become more rare. In winter, there can be periods of bad weather, but also sunny days. Every so often there may be cold periods, with wind and rain, highs around 5/7 °C (41/45 °F) or less, and possible falls of sleet or snow, but less often than in the rest of Japan (at least at least as far as the main islands are concerned). Snowfalls, however, are generally light, as are nocturnal frosts. Summers, which last until September or even early October, are hot and humid; there can be periods of good weather, with maximum temperatures around 35 °C (95 °F), tropical nights and high humidity, but also periods of bad weather due to the summer monsoon. The temperatures of the airport, located in a green zone, about 30 kilometers (18 miles) north-east of the city, and 270 meters (885 feet) above sea level, are much lower than in the city: for example, in January 2016 the temperature dropped to -9 °C (16 °F) in the airport, and to -5 °C (23 °F) in Kagoshima. The rains are definitely abundant, since they amount to 2,300 millimeters (90 inches) per year; winter is the driest season; the rainiest months are June and July, ie the first period of the rainy season (called Baiu), which in southern Japan is particularly marked, especially on the west and south coast, where Kagoshima is located: sometimes the rains can be torrential. In the southwest of Japan, autumn is a decent season, and already in October it typically does not rain very often. From June to October (but especially from August to early October), Kagoshima can be affected by typhoons, the tropical cyclones of Southeast Asia. The cherry blossoming in Kagoshima occurs around April tre 3rd. The amount of sunshine in Kagoshima is not very good, however, there is a maximum in August, after the Baiu rains, with 6 hours of sunsine per day, while in June, a month of heavy rains, they are only 4. 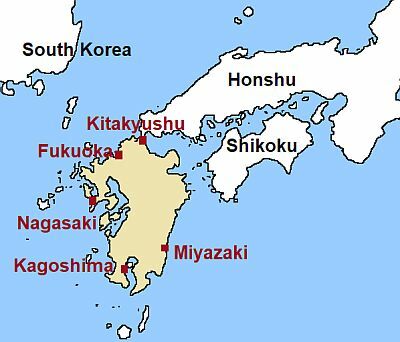 Kagoshima is located on the coast, in a bay, and in front of the city there's an active volcano, Sakurajima: because of the similarity of the landscape, and also of the climate (at least with regard to the mild winter), the city has been associated which Naples, Italy, to which it is twinned. The sea in Kagoshima is quite cool in winter, but not impossible for a swim; it is warm enough for swimming, with a temperature of 23 °C (73 °F) or more, from July to October, and it becomes pleasantly warm from July to September.